Review: The Toy Story trilogy concludes in Disney/Pixar’s Toy Story 3. 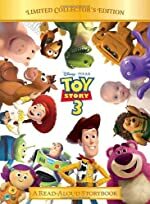 This is a much anticipated movie, and the read-aloud book, Toy Story 3: Read-Aloud Storybook by RH Disney, is a great bedtime story for kids. It features all your favorite Toy Story pals like Woody, Buzz, Jessie and Bullseye. The book begins with the Toy Story gang reliving the adventures they experienced while playing with Andy. But, now Andy is all grown up and heading out for college. In packing up for college, Andy puts Woody in the college box and Buzz in a trash bag with the rest of the toys. Andy’s mom mistakenly puts the bags in the garbage, when really Andy meant to put them in the attic. Woody once again saves the day with a pair of scissors. The toys sneak into a box that is meant for donating and they wind up at Sunnyside Daycare. The toys are greeted by Lotso the Lots-o-Huggin Bear who shows the gang around the caterpillar room, the place where they were assigned. Woody desperately tries persuading the gang that they are still Andy’s toys and should return to Andy, but the toys would not be swayed. Woody leaves the daycare bent on finding Andy. The toys soon realize that the caterpillar room is for energetic toddlers who do not know how to properly play with the toys, and that the other toys may not be as nice as they really seem. Will Woody ever get back to Andy? Will the gang survive another day of this innocent abuse? Only you can find out by reading the Toy Story 3: Read-Aloud Storybook. I loved this book. My sister wanted to watch the movie and she got me excited. When I saw this book I was thrilled because I would learn the plot of the movie. This read-aloud book goes more in depth than the picture books I read when I was a child. Plus, it is full of surprises – both good and bad. In addition, I was shocked when Buzz started speaking in Spanish. It is a funny random part of the book. The book is filled with these kinds of moments. In that it is a read-aloud book, it is filled with very well illustrated pictures. The pictures look a lot like the movie with painted backgrounds. They help bring the story to life. I happened to find an Easter egg in the book too! If you are familiar with the original Toy Story, the toy destroying boy, Sid, makes an appearance in the book. He is the garbage man who is easily identified by the skull shirt. All in all, Toy Story 3: Read-Aloud Storybook is an amazing storybook for kids of all ages. Review written by Ohm (7th grade student). We would like to thank Random House for providing a copy of TOY STORY 3: Read-Aloud Storybook for this review. Have you read TOY STORY 3: Read-Aloud Storybook? How would you rate it?